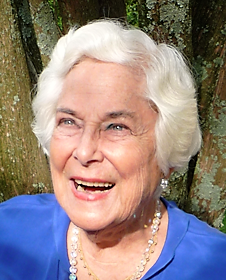 Mary Ann (Larson) Meenan, wife, mother, grandmother and great-grandmother, departed in peace on January 24 at age 97 surrounded by the love of family in Bethesda, Maryland. Mary Ann was predeceased by her much loved husband of forty-eight years, Daniel C. Meenan as well as her parents, Pearl (Kugelman) and Harry Larson, and her sister Harriet Young. She is survived by her five sons, Dan (Linda), John (Marchal), Jim (Patty), Tom and Mike (Ann), as well as nine grandchildren, Maryann Heim (Chris), Michael (Anna), Matt (Emily), Jim (Lauren), Sean (Alexa), Kevin, Annie, Joy and Katie Meenan. In addition, Mary Ann treasured her nine great-grandchildren, Alison Heim, Jack, Maisy, Ryan, Harrison, Ellie, Everett, Griffin and Amelia Meenan, as well as many nieces and nephews. Three months later, Dan proposed marriage on Mary Ann’s birthday in 1947 and following their marriage, they moved to New York where he entered the restaurant business with his father. In the early 1950s, Dan returned to United Airlines, moving the family first to Denver and then Chicago where they settled in Glen Ellyn, Illinois in 1953. There Mary Ann and Dan raised their five sons while Mary Ann was active at St. Petronille Church and School, Cub Scouts, the Glen Ellyn Library Board, Glen Oak Country Club and numerous social and charitable groups. In retirement she and Dan split their time between Glen Ellyn and Palm Beach, Florida where again Mary Ann became much involved in St. Edward Church activities as well as volunteering at Good Samaritan Hospital, and was a member of The Beach Club. Mary Ann was also a long time and proud member of United Airlines Clipped Wings, as one of its oldest members. Mary Ann moved to the Washington, D.C. area in 2003 to be close to family. She spent fifteen years at Riderwood in Silver Spring before moving to Larmax Homes at Bells Mill in Bethesda, Maryland. Mary Ann's Funeral Mass will be Saturday, February 2 at 10 AM at St. Petronille Church in Glen Ellyn.